Achilles tendinopathy is considered to be one of the most common overuse injuries in elite and recreational athletes. However, the effect that the Achilles tendinopathy has on patients’ physical performance is still unclear. The purpose of this study was to evaluate if Achilles tendinopathy caused functional deficits on the injured side compared with the non-injured side in patients. A test battery comprised of tests for different aspects of muscle-tendon function of the gastrocnemius, soleus and Achilles tendon complex was developed to evaluate lower leg function. 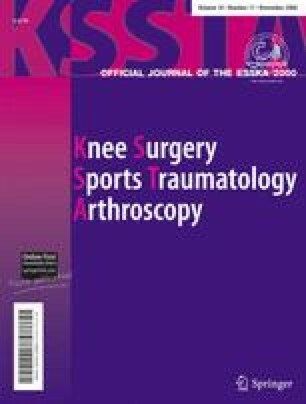 The test battery’s test–retest reliability and sensitivity (the percent probability that the tests would demonstrate abnormal lower limb symmetry index in patients) were also evaluated. The test battery consisted of three jump tests, a counter movements jump (CMJ), a drop counter movement jump (drop CMJ) and hopping, and two strength tests, concentric toe-raises, eccentric–concentric toe-raises and toe-raises for endurance. The reliability was evaluated through a test–retest design on 15 healthy subjects. The test battery’s sensitivity and possible functional deficits in patients with Achilles tendinopathy were evaluated on 42 patients (19 women and 23 men). An excellent reliability was found between test days 1–2 and 2–3 for all tests (ICC = 0.76–0.94) except for concentric toe-raise, test 2–3, which had fair reliability (ICC = 0.73). The methodological error ranged from 8 to 17%. There were significant differences (P = 0.001–0.049) between the non-injured (or least symptomatic) side and injured (most symptomatic) side for hopping, drop CMJ, concentric and eccentric–concentric toe-raises, and significant differences (P = 0.000–0.012) in the level of pain during CMJ, hopping, and drop CMJ. The sensitivity of the test battery at a 90% capacity was 88. Achilles tendinopathy causes not only pain and symptoms in patients but also apparent impairments in various aspects of lower leg muscle-tendon function as measured with the test battery. This test battery is reliable and able to detect differences in lower leg function between the injured or “most symptomatic” and non-injured or “least symptomatic” side in patients with Achilles tendinopathy. The test battery has higher demand on patients’ function compared with each individual test. The authors thank physiotherapists Andreas Hansson and Patrik Jacobsson for their participation in the study. This study was supported by grants from the Swedish National Centre for Research in Sports and The local Research and Development Council of Gothenburg and Southern Bohuslän.